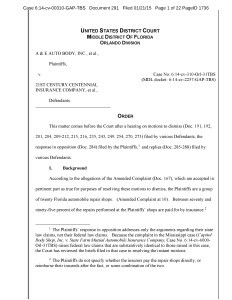 U.S. District Court Judge Gregory Presnell on Wednesday wounded six parts of a Florida lawsuit brought by body shops against insurers and killed the seventh element for good. In a Middle District of Florida ruling that could have implications for the at least 25 other cases involved in the multidistrict legal action tied to the court, Presnell dismissed six “counts” without prejudice, meaning they can be refiled with a revised argument, and the other with prejudice, which means no do-over for the plaintiffs. The case alleges price manipulation efforts by multiple insurers which affected shops in and outside of direct repair programs. The shops’ claim of “quasi-estoppel” appears to have been killed altogether, although there’s a bit of confusion in the ruling. The other six claims involve boycott and price-fixing in violation of the Sherman Antitrust Act, conversion, “quantum meruit,” “tortious interference with business relations” (basically, interference), and unjust enrichment. Quantum meruit under Florida law is an implied contract where Party A gives Party B something (whether that’s an item or a service) for free that any reasonable person would have been paid for. As that is has been called “unjust enrichment” under Florida law, and Presnell gave a single ruling that applied to both counts. Quasi-estoppel under Florida law holds that you can’t “occupy inconsistent positions” — meaning, you can’t have your cake and eat it too. Presnell wrote that this has never been used as an offense, only a defense, under Florida law, and noted its similarity to “equitable estoppel” — which absolutely can’t be used to sue someone. Hence, he dismissed that claim and closed the door on the shops using it to attack the insurers. There appears to be a serious typo in the order’s concluding paragraph which states that the tortious interference claim was the one dismissed with prejudice, even though Presnell seems quite clear earlier that the quasi-estoppel suggestion is the one he’s killing. The shops can try and file new arguments by Feb. 10, 2015 — which isn’t a lot of time. Plaintiff’s liason counsel Allison Fry of Jackson, Miss.-based Eaves Law Firm said Presnell’s ruling had “a few wrinkles,” but the firm had been prepared for it and the case was far from over. “It results in a delay, but it is certainly by no means fatal,” said Fry, whose firm is lead counsel for the Florida case as well as several other states’ actions in the multidistrict litigation (“MDL”). Fry said Presnell’s ruling applied only to the Florida lawsuit, and his subsequent rulings would apply to each of the states in the MDL separately with regards to their arguments and state law. However, his ultimate decision on the federal antitrust issues in one state could have repercussions on others, she said. She expressed confidence Eaves would be ready with new arguments to satisfy the court by Feb. 10. The case is a massive undertaking for Eaves and the first multistate one for the firm. There are between 5-8 attorneys at Eaves alone working full-time on the MDL and other assisting attorneys in the other states involved, she said. “It’s been really delightful,” she said. Fry couldn’t for obvious reasons get into the strategy going forward on the Florida lawsuit and other cases. But here’s Repairer Driven News in-depth look at the charges and Judge Presnell’s reasons for dismissing them — which might indicate new plans of attack for body shops. Presnell disagreed, citing Florida case law that indicates the benefit provided is to the driver whose vehicle was fixed — not to the insurer who paid the bill. He also wrote that the insurers keeping the money that the allegedly unfair prices allowed them to save didn’t count as a benefit — they’d have to get a benefit, then keep the money. But all is not lost: One of the reasons Presnell dismissed the charge was that price-fixing, if true, was “wrongful conduct” that needs to be argued differently then with an unjust enrichment claim. So shops can still seek action — they just need to make a different argument. The shops accused insurers of bad-mouthing shops to customers and “steering” them away, which would be interfering unjustly in a business relationship with customers. Presnell sort of ruled this one a tie. However, you can’t conspire against, intimidate, misrepresent against, or threaten while you’re “interfering” — and so if insurers did so (as the shops have alleged), that’s tortious (bad). So there’s one avenue for attack. But there’s a catch — Presnell also ruled that the shops actually have to show which customer or potential customer received the improper interference. Accusing the insurers for getting in the way of “a business’s relationship to the community at large” is too general and doesn’t work under Florida law, and Presnell said that the examples of policyholders affected never had any contact with the shop. Presnell said that while there was some confusion between the shops and insurers, he interpreted the accusation of price-fixing as horizontal (between insurers) instead of vertical (between insurers and other parties in the food chain). Judge Presnell’s ruling in A&E Auto Body et al. v. 21st Century Centennial Insurance Company et al.